A Ferrie on the cut – but who with, and where? I love how the blog allows stories to unfold slowly, gradually adding more and more information and evidence as time passes; and so it is with the story of the Charles Ferrie narrowboat, which Ralph Ferrie donated to Brownhills Youth Club in 1962, and was named in memory of his father. The original coverage of the story is here, complete with discussion of the youth cub and members. Well, over the weekend Emma Smith got in touch with a collection of recently unearthed photos of the Charles Ferrie boat on a day trip… and we’d like to know where, please? My dad’s brother Maurice Smith recently came up with these fine photos of a day out on the cut on a Charles Ferrie narrowboat. Can anyone help with the names of lads on board and the locations, please? Maurice seems to remember Wolverhampton way but not sure. One lad for sure other than my Uncle Maurice Smith is Edward Hassle who later became a Teacher at my old Primary School – Castlefort JMI in Walsall Wood. Thanks Emma for that, a great contribution to the history of the Ferrie empire – it’s hard with such a larger than life character sometimes to get past the rumour and mythology, so every bit of material we can share and add to the story is wonderful. Thanks for your generosity. If you can identify either places or people in these photos, or indeed, can add anything to the story, please do comment here, or mail me on BrownhillsBob at Googlemail dot com. Cheers. 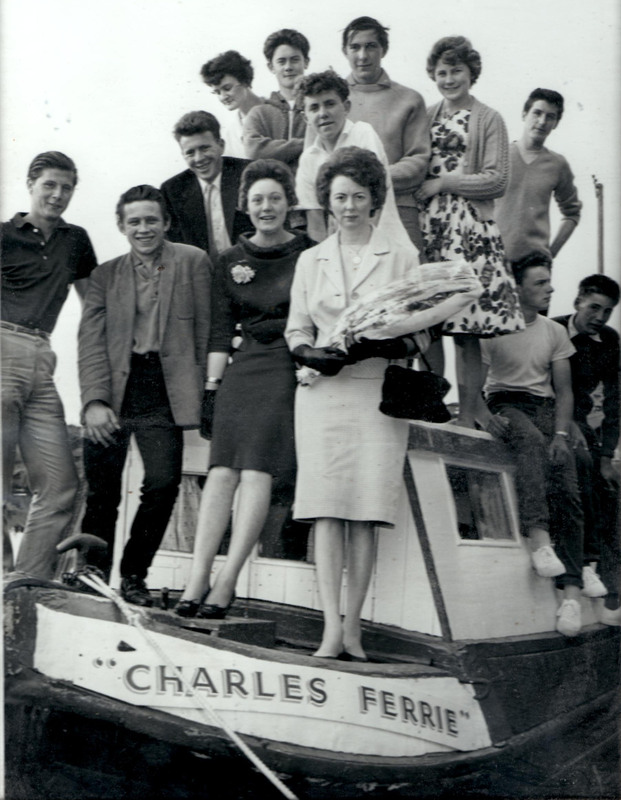 Remarkable image of the unveiling of the Charles Ferrie narrowboat in 1962, Amy Ferrie holding the flowers I believe. Image supplied by Tony Winn. This entry was posted in Brownhills stuff, Clayhanger stuff, Environment, Events, Followups, Fun stuff to see and do, Interesting photos, Just plain daft, Local History, Local media, News, Reader enquiries, Shared media, Shared memories, Walsall community, Walsall Wood stuff and tagged 1962, Amy, Barge, Brownhills Youth Club, Charles, Charlie, Ferrie, naming, Narrowboat, Ogley Junction, pleasureboat, Ralph, rocket, rocket science, Tony Wynn, University, unveiling, Walsall Observer. Bookmark the permalink. 12 Responses to A Ferrie on the cut – but who with, and where? I think the picture with the gasholder might be on the attached map. OS 1938 revision, published about 1945. Reproduced with the permission of the National Library of Scotland. I don’t think it is Oxley Viaduct, Oxley is more substantial and the locks are further away. The photographs were taken around locks 14-12 of the BCN “Main Line” adjacent to Wolverhampton Stafford Road Gas works. The photos show the barge heading south towards lock 13; in lock 13; in lock 12 adjacent to the Stour Valley Railway viaduct (the ex-GWR Wolverhampton LL to Wellington line bridge at Stafford Raod engine shed and works, can be seen in the distance through the arch), so the photo is looking south; leaving lock 14, with the bridge carrying the gasworks internal railway system in the background. The building in the foreground in the photos is another part of the gasworks. For the photo of the barge at mooring may I suggest either Calf Heath or Gailey – this is purely guess work based on the building in the background which is similar to structures found on the Staffs & Worcs canal, does not look like Brownhills but I’m sure some one will be able to pin point it and correct the error of my ways! Two of the lads by the lock are Ken Foster & Ted Hassel who were very big friends. I spent many a happy hour in their company in the late 60s early 70s. Yes location of the shot I identified as Oxley is actually further towards Wolverhampton. The viaduct carries the LMS line over the cut and the girder bridge in centre took the railway past and into Stafford Road shed and works of the GWR. Although younger than myself i can name a few there is barry horton graham ward colin taylor jeff wooton and some others i will recall later i am in touch occationally with graham ward so he will give me more names be in touch soon.